On this date in 1476, a peasant preacher who nearly stirred a revolution was consigned to the flames in Wurzburg. Hans Behem (or similar variations on that surname, e.g. Bohm or Boheim) is known to posterity as the Drummer of Niklashausen, for when he descended into that Tauber River town for Carnival he performed with this instrument. His vocation — his peasant’s lot in life — was sheep-herding. The Virgin Mary appeared to him. Carnival, just ended, was “liminal time”: time for inversion of natural orders, time for foolishness, time for liberation. If the rite confined and discharged potential social pressures, “liminal time” also held a latent threat to the ordered world of lords and bishops. What happened if sublime religious revelation burst the calendar’s boundaries and flooded ordinary time with the liminal? Thanks to this vision, 1476 would be a year out of time. Hans apparently knew a Beghard mystic who dwelled in the hills where he pastured sheep. In the fullness of time, this anonymous man would die with the drummer; the precise nature of their association is a matter for speculation, though some would later charge (the better to derogate the illiterate boy’s supposed divine revelation) that the Beghard orchestrated the whole thing. 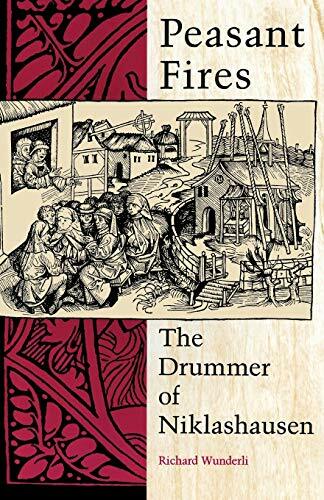 Nevertheless, the proximity to the Drummer of Niklashausen of an adherent of the suppressed Beghard movement underscores the link between Hans’s subsequent preaching and the centuries-old tradition of radical poverty. Elites long viewed these movements as seditious, and why not? Poverty was the material lot of most people just as it had been for Christ himself, but it was self-evidently not the lot of Christ’s vicars, who in fashionable attire bought with forced tithes and the sale of get-out-of-purgatory indulgences breezed obnoxiously past the everyday tolls and levies that crushed their flocks. Arrogant, predatory lords made out even better than that. Sacralized poverty ever sat next door to levelling — next door to revolution. What could peasants find more agreeable than that they had been freed from all payments of rents and tenant services, and that thereafter they would hold everything in common with the clergy and princes? Truly, what could a layman find more desirable than that he should see the clergy and priests immediately stripped of all privileges and liberties, and denied their collection of tithes, rents, and the proceeds of the holy altar? Madness … or divinest sense. Hans, of course, obeyed the Virgin’s charge to him. 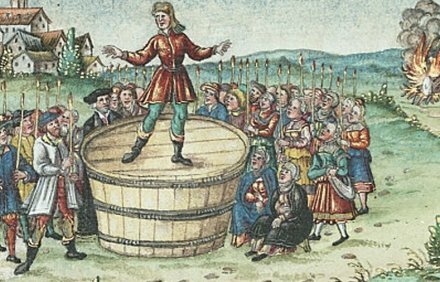 Just after Easter, he publicly burned his drum — his own little vanity — and began preaching in Niklashausen. Maybe the words came from the Beghard, or from the alleged mendicant friar who was rumored to whisper to Hans. Maybe the young man had a natural gift for oratory and a few lucky breaks. But to tens of thousands of German peasants who soon began arriving, he was a holy youth, the vessel for heaven. Hans’s prayers lifted the interminable frost, sparing at least some portion of the year’s crop. Peasants from all around the region caught wind of the supernatural event and began up and disappearing from their places without notice or excuse, leaving work half-done to join troops of their fellows making pilgrims’ tracks to Niklashausen. There, they too were summoned to cast aside all their own vanities as well,* and into the flames went stylish clothes, sinful dice and cards. The drummer’s preaching veered apocalyptic. 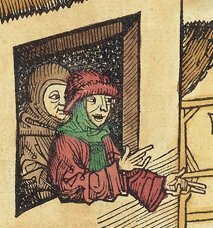 Medieval people would have believed of a course that God’s pleasure or disfavor went abroad in the world; the awful winter (only the latest in a series) and, for peasants, a generation of deteriorating material conditions and multiplying taxes, would have stood witness to the Lord’s dissatisfaction. The miracles attributed to Hans — healing the lame, the blind, and the mute; even raising a drowned child from the dead — were of a piece with his words, with the bonfires, with the favor of the Virgin Mary. “The Emperor is a miscreant, and the Pope a nonentity. It is the Emperor who gives to princes, counts, and knights authority to tax and burden the common people. Alas! for you, poor devils!” Spies in the crowds, no doubt paraphrasing prejudicially, captured for the alarmed archbishop and lords the dangerous sentiments being preached in Niklashausen to crowds swollen into the tens of thousands who might not easily be controlled. Princes, civil and ecclesiastical, ought to possess no more than common folk, and then all would have plenty. The time would come when princes and nobles would have to labour for a day’s wage. The fish in the water, and the game upon the land, ought to be common. Tolls, road-money, servitudes, rents, taxes, and tithes to spiritual or temporal superiors were to be wholly done away with. On the night of July 12, 1476 — the eve before the Drummer was to preach a sermon for which he had asked his followers to arrive armed — 34 mounted knights burst into the farmhouse where he was staying and hustled the firebrand into custody before anyone could resist. The movement was beheaded and it fractured quickly: after a day of confusion, some of them set off on a march to nearby Wurzburg, where the Drummer languished in the Archbishop’s fortress, a position that the rabble was in no position to take by main force. Many gave up the enterprise, but dozens, maybe a hundred or more, were captured and filled Wurzburg’s dungeons to overflowing. 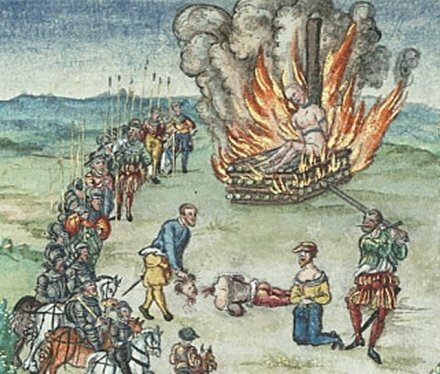 Hans was burnt flesh either way: this is the fate of martyrs. It was essential that he also be discredited, though the effect was scarcely immediate. Certainly, there were those who with imprudent faith believed that his whole affair originated in heaven … they hoped that God would preserve him from being killed; or if God allowed him to die, then He would take immediate vengeance on the courts that condemned the Youth. Others, who were more sane, among whom were the bishop and his clergy, did not fear the vengeance of God for the death of this wicked man; rather, they earnestly, sensibly, and rationally feared that spiteful, evil spirits — who take delight in possessing superstitious people — would scheme some plot of guile and deceit at the execution. For they judged that little Hans was not a man of God but was possessed by the devil. At last the judgment of death to little Hans was to be carried out … After he had been led to a level piece of ground, which is behind my monastery near the house of the lepers, he was seated and bound with ropes. Nearly all the citizens of the town stood by armed, waiting for him to be delivered to the fires. In the meantime, two evildoers who were with him received a sentence to have their heads cut off. After they were beheaded, little Hans asked the magistrate: “Are you going to hurt me?” The magistrate replied: “No, but someone has prepared a bath for you” — for the Youth had not yet seen the pile of wood for the fire, or if he had seen it, he perhaps did not know what it was. When he was tied to the stake for burning, however, he sang certain songs or verses in a high voice about Our Lady, which he had composed in the German language. Among the bystanders were many who believed that the man could not be burned because of the merit of his holiness, by which they thought he would be preserved by the Mother of God. Hence, they were afraid to stand near him. They were terrified that perhaps the fire would be scattered about by divine fury and would consume those observing the execution. Others feared that the Youth could not be burned because of the protection of demons or of some other sorcery. Therefore, the executioner — who also feared this — caused all the Youth’s hairs to be shaved, so that no evil spirit or demon would be able to hide in them. Bound to the post, the Youth shouted his songs. But as soon as the fire was set below him and he felt the flames, he cried out three times with a weeping voice: “Ow, ow, ow.” He was then engulfed by the flames. His voice uttered nothing again. Consumed by the voracious fire, he was reduced to ashes. No miracles happened, nothing that demonstrated that Innocence had been consumed by fire. Nevertheless, so that the frivolous devotion and fear of stupid people not fashion him into a martyr, the executioner ordered that all his ashes be thrown into the river. After this was done, the gathering of the people at Niklashausen came to an end. The “gathering” did not quite blow away with the Drummer’s ashes, not just like that. Despite edicts from nearby cities against the practice, pilgrims continued journeying to Niklashausen over the following months: not with the number and character sufficient to threaten revolution, but more than enough to make the authorities jumpy. The Archbishop was so desperate to quash these pilgrimages that in 1477 he had the church at Niklashausen razed. 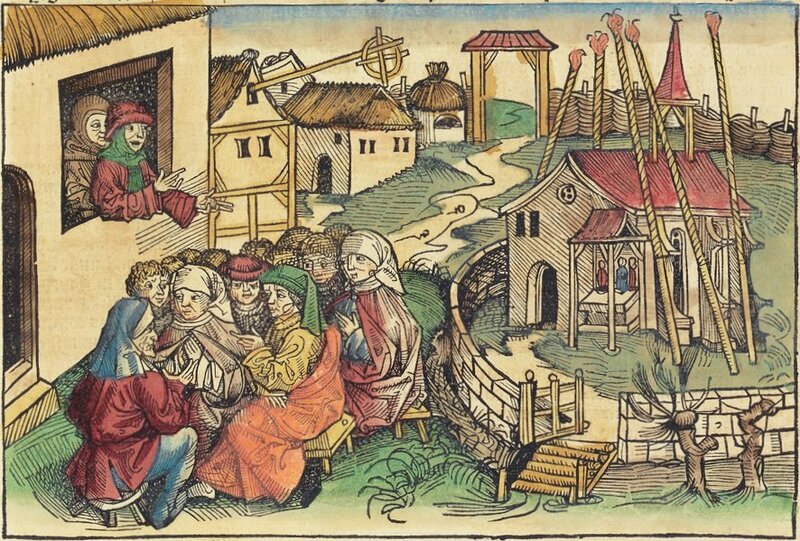 In those years and long after, chroniclers as one scorned the Drummer and his flock; Sebastian Brant’s 1494 satire Ship of Fools also singles out des sackpfeifers von Nickelshusen (the bagpiper of Niklashausen) and those who followed him.† Hans’s people, illiterate commoners, don’t have a voice in the histories. The grievances were never really answered. It was not until 1518 that authorities finally deemed it safe enough to rebuild the Niklashausen church … but even then, Germany had not heard the last of peasant revolution. ** Wunderli notes the movement’s apparent indifference to Jews, despite its falling in the immediate wake of one of Europe’s most inflammatory blood libel cases. These peasants were not assembled for a pogrom; it was their Christian oppressors whom they hated. † See the German version Das Narrenschiff, under “verachtung der gschrift”, “contempt of scripture”.